Trey Fix-Wolansky notched a three-point night to regain the WHL scoring lead as the Edmonton Oil Kings (14-8-1-2) dropped the Brandon Wheat Kings (10-6-3-3), 4-1, in front of 3,237 fans at Westoba Place on Wednesday night. Fix-Wolansky’s goal and two assists gives him 48 points in 25 games, and restores his lead in the league scoring race over Prince Albert’s Brett Leason (47 points), who had a hat-trick performance last night vs. Lethbridge. 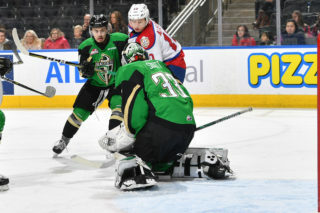 The Oil Kings trailed 1-0 early on Wednesday, but scored four unanswered goals – including three in the first period – en route to the victory to get themselves back into the win column and give the team points in eleven of its last 12 games. 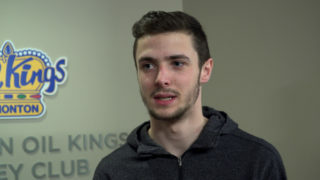 Dylan Myskiw earned the win in goal for Edmonton as he returned to Brandon to take on his former team for the first time since being acquired by the Oil Kings in September. 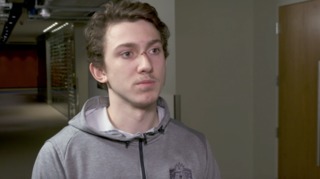 He turned aside 30 of 31 shots to improve his record to 11-5-1-1 on the season. 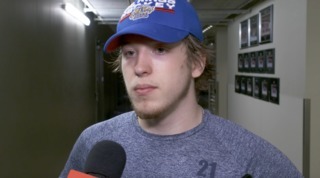 His counterpart Jiri Patera (8-6-2-2) took the loss, surrendering three goals on 34 Oil Kings’ shots. Stelio Mattheos’s 19th goal of the season gave the Wheat Kings a 1-0 lead via a power play goal just 2:49 into the first period, with assists to Luka Burzan and Zach Wytinck. But just over two minutes later the Oil Kings responded, as Brett Kemp entered the offensive zone on a 2-on-1 with Fix-Wolansky but elected to take the shot himself, deking Patera to tie the game, 1-1, unassisted for his 16th of the season at 4:50. With the first period nearing an end it was Quinn Benjafield who scored his first in five games to give Edmonton a 2-1 lead, from Jake Neighbours and Zach Russell at 16:38. 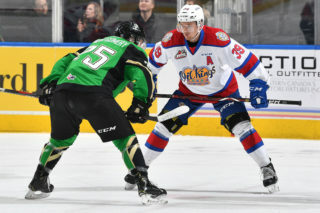 The Oil Kings weren’t done contributing in the first period through, as they extended their lead to 3-1 as Fix-Wolansky tallied his 14th of the season on the power play, from Vince Loschiavo and Conner McDonald with just 39 seconds left in the frame to send the game to the first intermission. Shots on goal in the opening 20 minutes of play favoured Edmonton, 16-13. After a scoreless second period most of the third period followed suit, as the final goal of the game came on the stick of Benjafield, his second of the game and 10th of the season into an empty net to ice the 4-1 victory for the visitors, assisted by Fix-Wolansky and Matthew Robertson at 19:52. 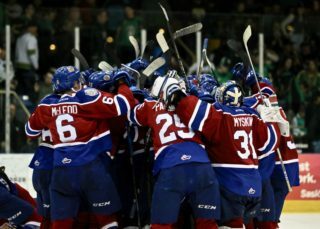 Shots on goal through 40 minutes of play were 25-24, Oil Kings and 35-31, Edmonton at the end of regulation. Brandon was 1-for-1 on the power play while Edmonton finished the night going 1-for-2 with the man advantage. Dylan Myskiw (EDM) (3), Trey Fix-Wolansky (EDM) (2), and Brett Kemp (EDM) (1) were selected as the Three Stars of the Game. The Oil Kings are back in action on Friday, November 23 when they take on the Moose Jaw Warriors for a 6:00 PM MT (7:00 PM CT) start. They return to Rogers Place Wednesday, November 28 when they host the CHL’s top ranked Prince Albert Raiders at 7:00 PM MT.